Intermittent rain has brought down temperatures, and Delhi looks like it’s had a 'somewhat' good wash. With the dust of summer cleaned off  foliage, the greens looks brighter and more dense. 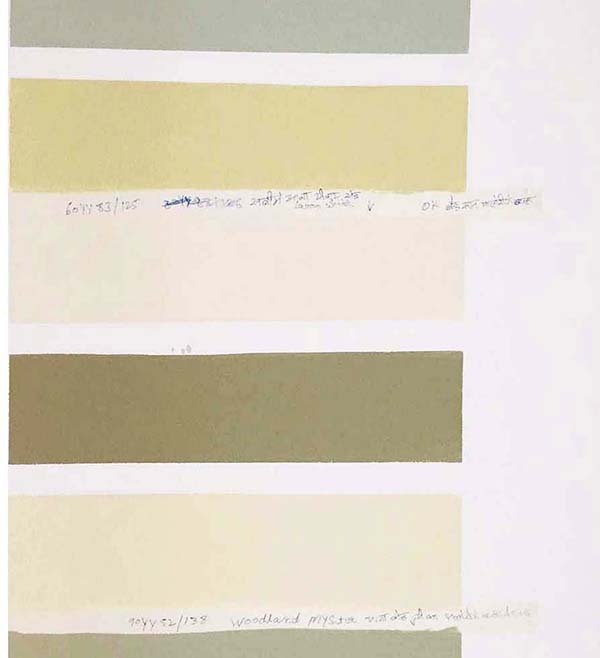 So dense and so varied in tone, that the mood board of a kitchen we’re designing is a medley of just green. Shades of the colour from 5 different locations have been melded together to soon be displayed in a kitchen. Credits:  Cardamom- Dariba Kalan, Fan Palms -Nehru Park, Haveli- Chandini Chowk, Dye- Sanganer, Painted windows- Jaipur. Photos of Jaipur, Sanganer and Chandini Chowk by Aayushi.